WASHINGTON (AP) — The Charlotte Hornets turned some well-timed rest into a much-needed win. Kemba Walker scored 28 points and the Hornets beat the Washington Wizards 116-110 on Friday night in a matchup of teams chasing the final Eastern Conference playoff berth. The Hornets came out after three days without a game and scored 40 points in the first quarter. 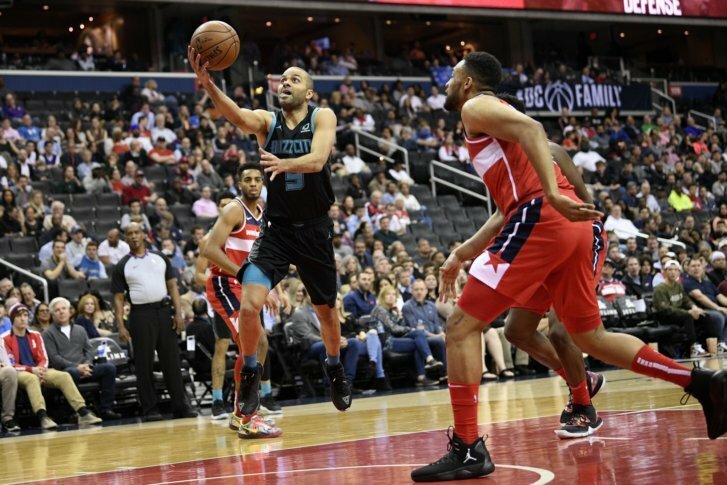 Jeremy Lamb added 18 points and eight rebounds, and Nicolas Batum and Tony Parker had 16 points apiece for Charlotte, which defeated Washington for the second time in eight days. Walker, coming off a 40-point effort against Houston, shot 11 for 30. Bradley Beal, who had 15 points in a loss at Charlotte last Friday, had 23 by halftime Friday night and finished with 40 points on 15-of-29 shooting. Jabari Parker had 17 points and 11 rebounds for Washington. Jeff Green scored 20 points. Charlotte put six players in double figures and its bench outscored the Wizards reserves 57-33. The Hornets scored 27 points off 17 Washington turnovers. Charlotte led by 21 early in the third quarter and was ahead 95-78 to start the fourth, but Jabari Parker’s floater cut the Hornets’ lead to 107-97 with 5:26 remaining. Washington got within six before Batum and Lamb hit 3-pointers. The Wizards rallied again and Green’s two free throws made it 113-108 with 1:56 to play, but Lamb answered with a three-point play. The Hornets led 25-20 when Frank Kaminsky’s 3-pointer started a 15-6 run to the end of the first quarter. “They came out just trying to punch us in the mouth, right then and there as soon as the tip started,” Washington’s Thomas Bryant said. Tony Parker scored the first five points of the second quarter and the Hornets led by as many as 21. Beal hit back-to-back 3-pointers and the Wizards cut it to five before trailing by 13 at halftime. Hornets second-year swingman Dwayne Bacon, who came in averaging 4.9 points, scored 13 points for his second straight game. Bacon played 29 minutes, shooting 5 of 8. Hornets: Won the season series, 3-1. … Michael Kidd-Gilchrist (left knee strain) retuned after missing two games. … C Cody Zeller (left knee soreness) missed his second straight game. Wizards: It was Beal’s fourth 40-point game of the season. … Fell to 2-11 in the first game of back-to-backs. . G Tomas Satoransky did not return after halftime and was being evaluated for a concussion. … F Sam Dekker (lower back soreness) returned after missing one game. … It was Parker’s sixth double-double of the season. Hornets: Visit the Miami Heat on Sunday. Wizards: Host the Memphis Grizzlies on Saturday.